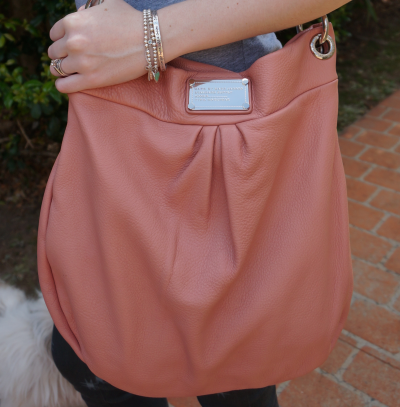 Before I bought my first ever designer handbag, I'd spent ages researching and reading up on it and struck up quite a few online friendships. One of my friends, @jessicaval, had recently been talking about Chloe Paddingtons again, and we all decided to get out our old favourites and carry them for an informal #internationalPaddingtonWeek. 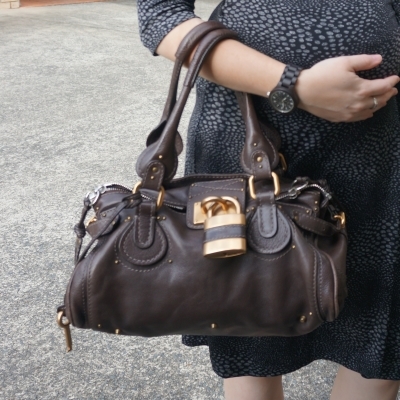 I only managed two days as I figured a heavy bag with a padlock wasn't best for a day at home with a toddler, but it was perfect for taking to the office. 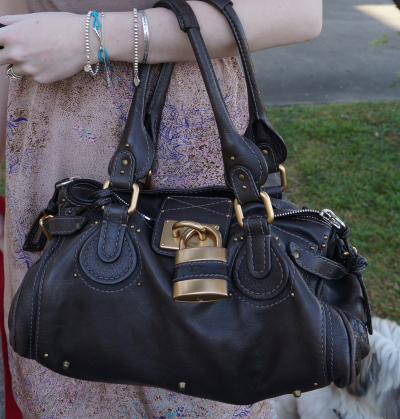 It reminded my why I love and keep this bag, even if I don't wear it often, there are so many happy memories attached. 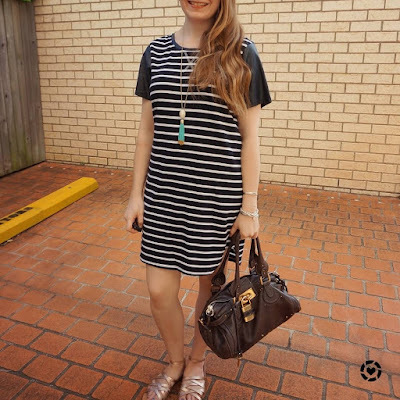 I'd only worn this dress two weeks ago, but really wanted to wear it again as I remembered I couldn't wear it after my second trimester in my last pregnancy as it was getting a bit tricky to wrap all the way around the bump. I'm glad I could give it one last wear before the baby arrives. 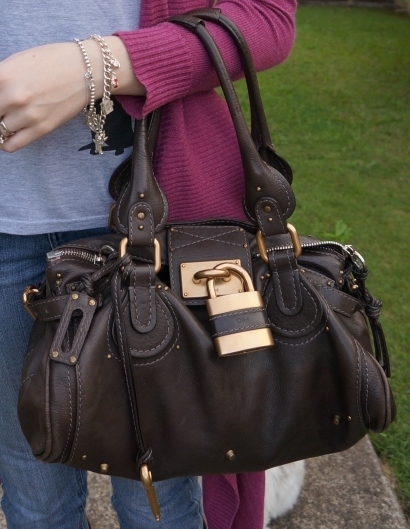 Picked gold flats to match the gold padlock on my Chloe Paddington. Can't believe it's been a year since I last wore it! 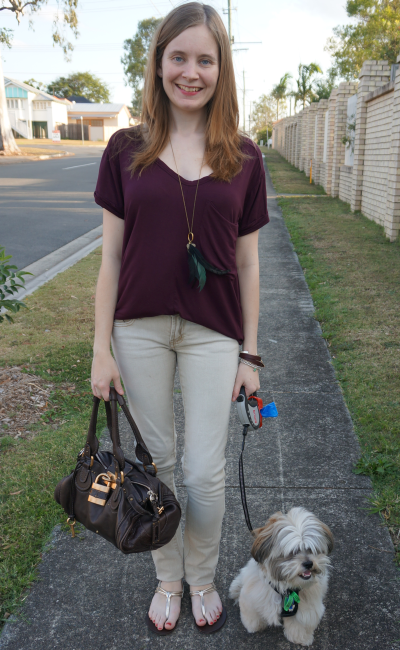 Last worn: Ray-Ban Wayfarer, brown marle tank, Jeanswest wrap dress, gold mouse flats, Chloe Paddington bag. Other ways to wear: brown marle tank and a maxi skirt, wrap dress layered up for winter, gold mouse flats and flares, Chloe Paddington bag and a vintage pencil skirt. Note: If you're ever looking for a Chloe Paddington I'd suggest not paying retail and instead buying second hand from somewhere that guarantees authenticity like Fashionphile, or Vestiaire Collective that authenticates the item after you purchase but before you receive it. I've featured bags from these places above. 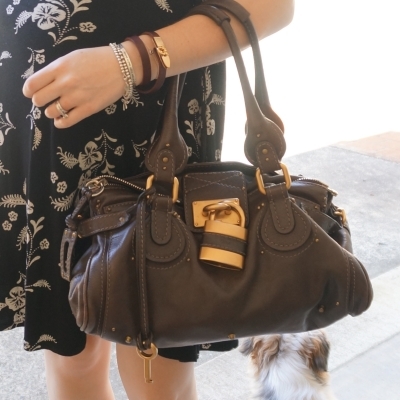 While ebay has a lot of Paddington bags, many are counterfeit. 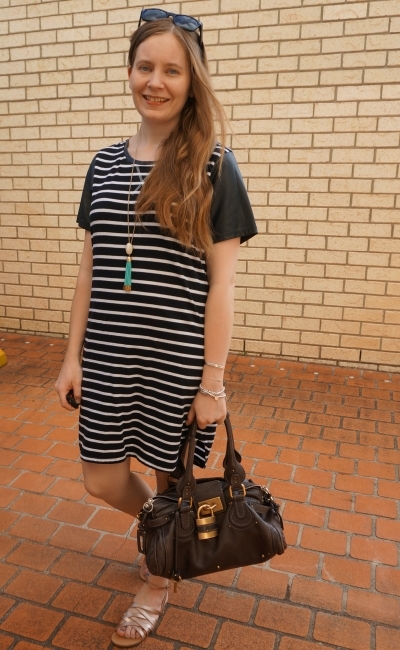 Another wrap dress! They are such easy maternity options. 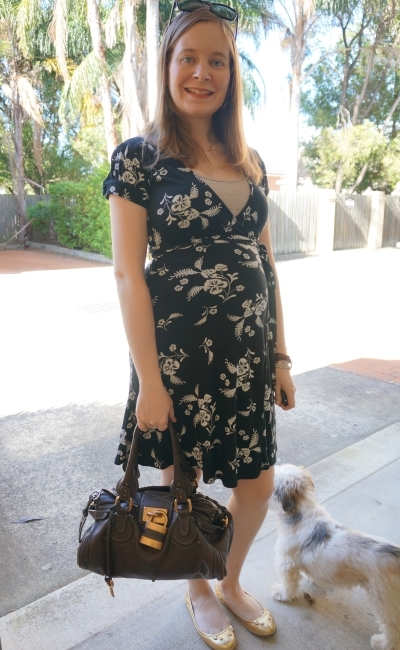 this is a special maternity dress that I picked up second hand on ebay in my last pregnancy, and wore it 6 wonderful times. 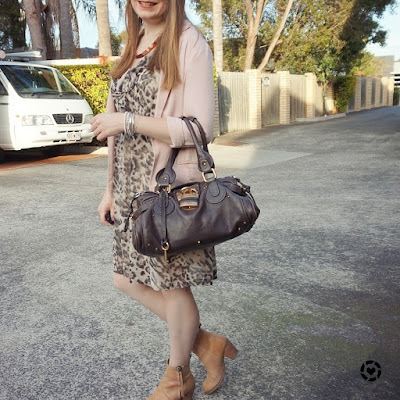 I wished I'd bought it sooner than I did, so I was pleased to be able to pull it out of the 'maternity clothes' bag I'd set aside and start wearing it now in the second trimester. I'm not looking to buy any more maternity workwear, with the two pencil skirts and this maternity wrap dress from last time I'm pretty set as I'm only in the office twice a week. I was a little sad to pack my Chloe Paddington bag away after wearing it, although it's not the most practical of bags and I can't use it every day I'm pleased @jessicaval inspired us to get our old bags out again. 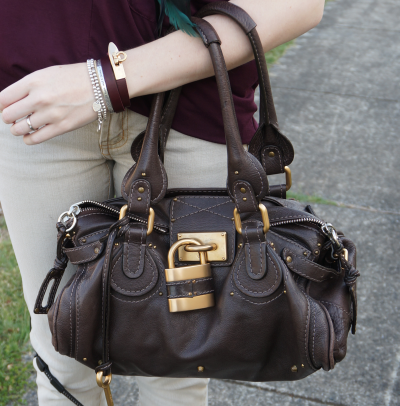 I know that there is still a lot of interest in the Chloe Paddington bag as the video review of it is one of the most popular on my channel! 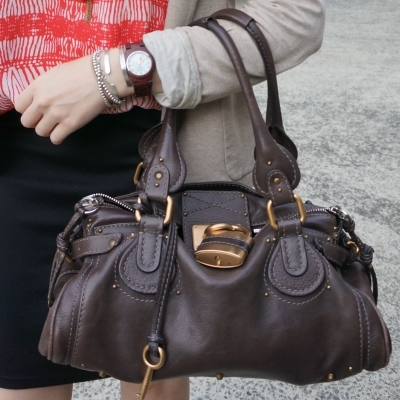 The Chloe Paddington will always be my first handbag 'love' and I'm never going to get rid of this one. 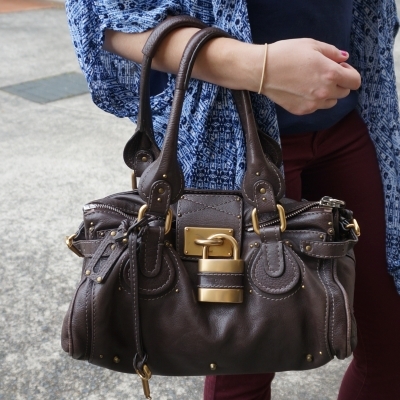 What was your first ever handbag splurge? Do you still own and use it? Last worn: Soon Maternity printed wrap dress, black ballet flats, Chloe Paddington bag (above). 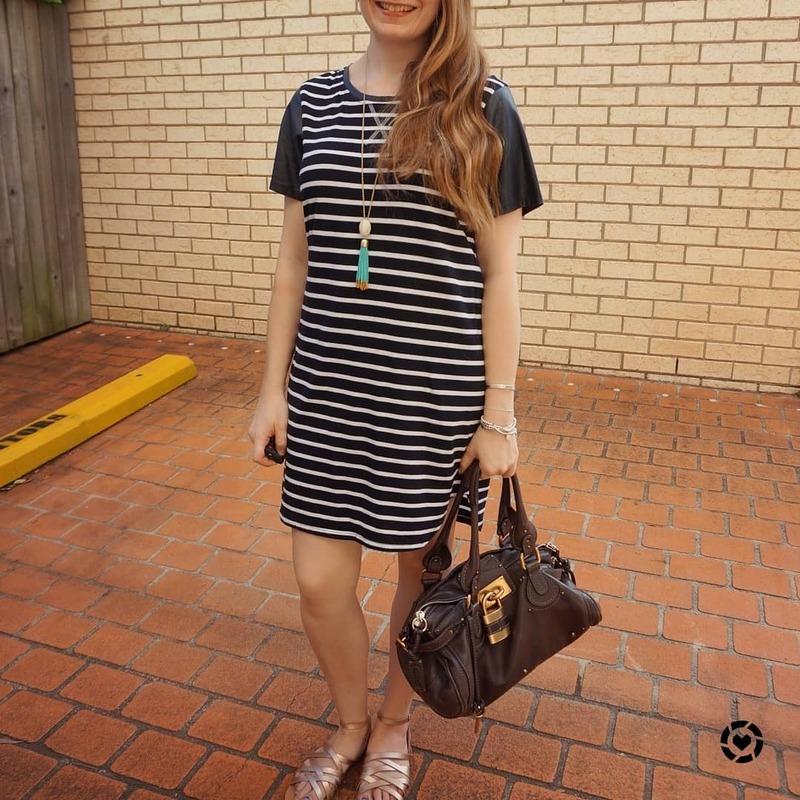 Other ways to wear: Soon Maternity wrap dress in the third trimester, black ballet flats and layers, Chloe Paddington bag and skinny jeans. 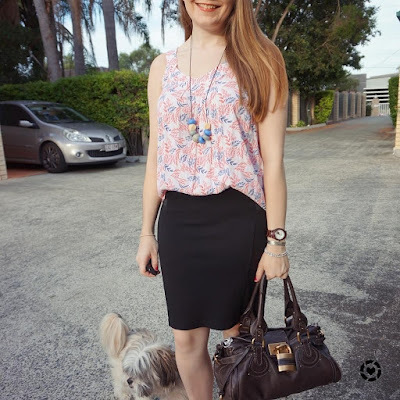 Linking up with Fresh Fashion, Pleated Poppy, What I Wore, Style Me Wednesday, Oh Hey Girl, Fashion Files, Throwback Thursday, What I Wore to Work, Weekend Link Up, Fun Fashion, Flashback Fashion. 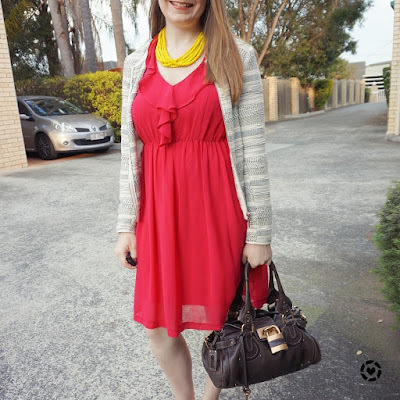 Kept everything fairly neutral after my bright monochrome orange outfit on Wednesday! 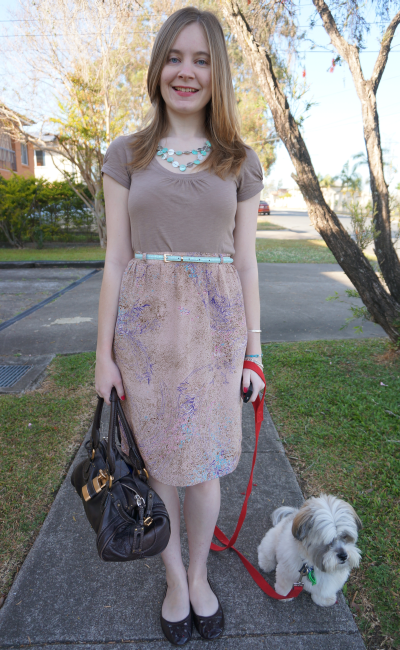 Wearing the last of my new purchases from my DFO Spring accessories shopping trip on the weekend, this cute belt. A couple of times I've worn this skirt people have suggested I add a belt, so when I saw this belt in Forever New my skirt popped to mind right away! Really liked the little bit of colour the belt added, brought out some of the blue in the skirt print. 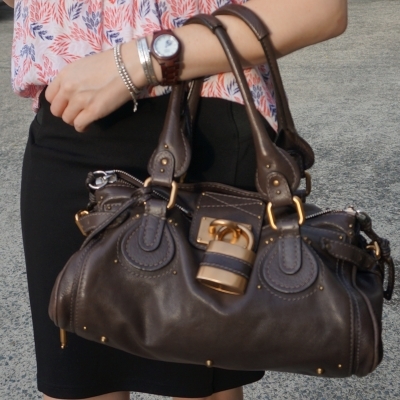 Last worn: brown tee, vintage skirt, cut-out detail flats, Chloe Paddington bag. I purchased this top a year ago and this is only the third time it's been worn, that's a really bad rate for such a pretty top! I definitely need to wear it more often. 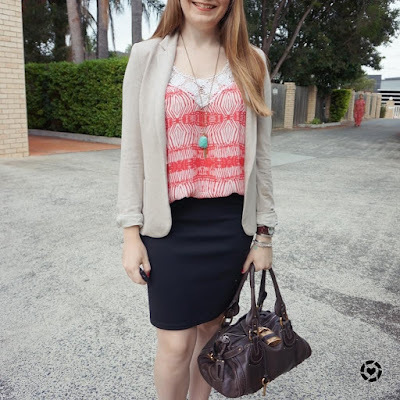 The top and blazer have been paired together before and I wasn't too happy with the outfit, but this time around I think it looks better with the top partially tucked in. What do you think? 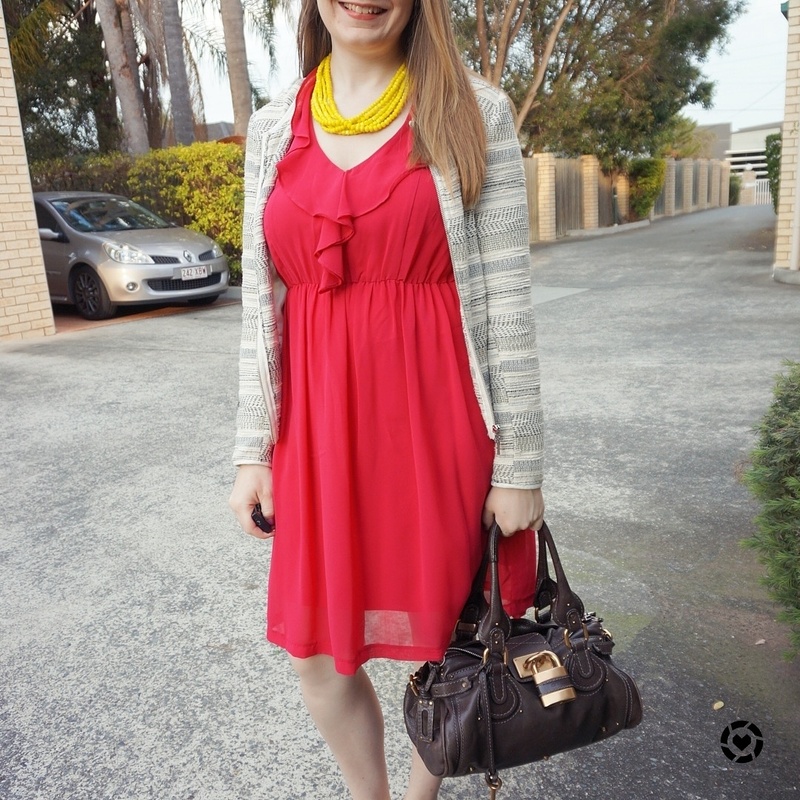 Linking up with Friday's Fancies, Casual Friday, Friday's Fab Favourites, Friday's Five today. Last worn: Zara jacket, embellished tank, Jeanswest skinny jeans, silver flats, damier azur neverfull. 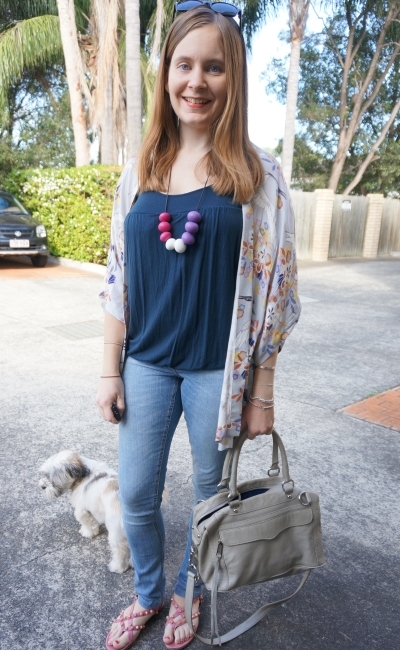 It was a little chilly near the end of the day so I wore a purple cardi over my jeans and tee outfit. Of course it covers up the print on the tee, haha. It says "a shelter dog changed my life...". Had a really nice evening catching up with friends and playing poker. Cooper even 'played'. 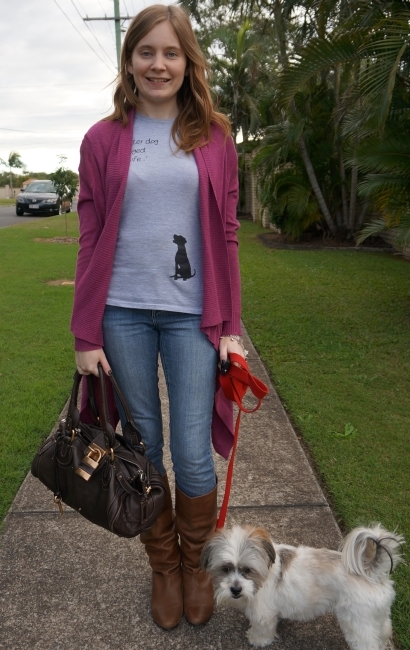 Last worn: purple cardi, shelter dog tee, skinny jeans, Asos Cleo boots, Chloe paddington bag. 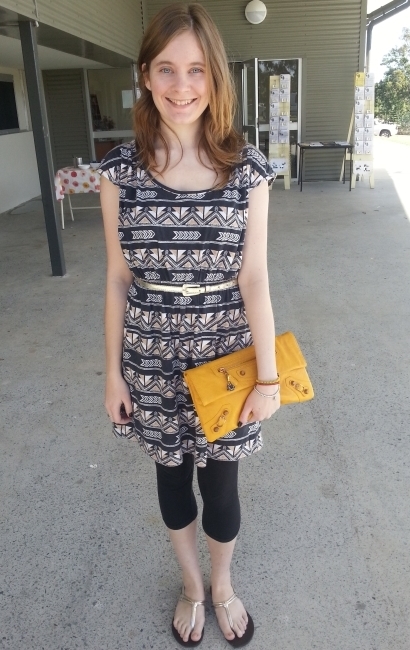 Had a really nice day today - went to church with the family (where my sister kindly took a blog photo) and then had lunch and a day out with my mum and sister. Came home to work at Church Online in the evening. Had planned to wear jeans but my sister convinced me otherwise, and we both ended up wearing a dress and leggings. Was quite warm in the sun after church, so I was glad I'd chosen the dress! 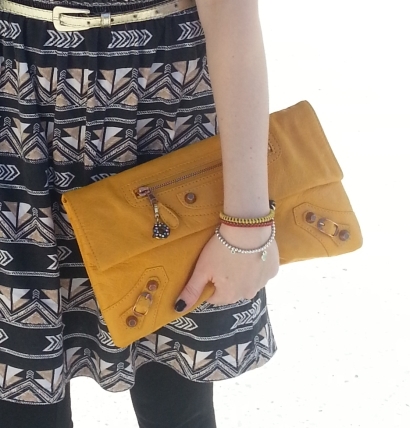 Last worn: printed dress, leggings, shoes, Balenciaga envelope clutch.